Asus has announced the Fonepad Note, a 6-inch Android tablet with pen input that will offer phone functionality via its 3G radio. Going up directly against the Samsung Galaxy Note II, the Asus handset has a 1080p IPS display with an 8-megapixal camera on the read and a 1.2-megapixel snapper on the front. Powering the device, which runs on Android 4.2, is a dual-core Intel Atom Z2560 1.6GHz processor with 2GB of RAM. Following in the steps of the HTC One, the Fonepad Note also has a pair of front-facing stereo speakers to show off. 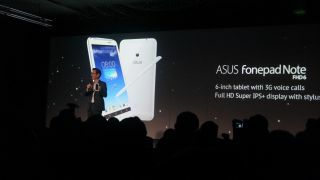 Asus hasn't given anything on release date or price just yet, but we'll update you as soon as we more on the Note.